These rounds come pre-loaded on stripper clips for easy magazine loading! The XM193J is a great cartridge for those who want caseloads of 5.56x45 but know that the stripper clips add significant value to their particular shooting routine. The same great federal American Eagle value pricing and component consistency, as well as the proven reliability and accuracy, this is the XM193 you’ve come to know and love from American Eagle, but with the added bonus of stripper clips. The 55 grain projectile is a very versatile bullet and works in just about every barrel twist within reason, offering great flat shooting trajectories and a clear cut advantage for smaller game or when you want fast, responsive shooting at short to moderate distances. 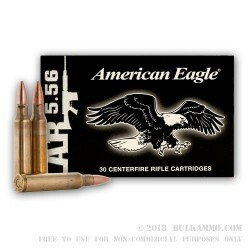 Packages 30 boxes to the case; with 3 stripper clips loaded with 10 rounds each in a box, you get 900 rounds of easy to load, easy to love American Eagle ammunition that performs exceptionally in the AR platform and beyond. Depending on the case purchase, the stripper clip guides may not be included with this case load. The factory has discontinued the inclusion of the guides, but the stripper clips are still very functional and you can fid guides elsewhere on the BulkAmmo website. Buy it when they have it!! Ordered this last week... Got it yesterday... Great turn around on the order!!! When I looked yesterday (11/6/12) they had 41 cases in stock... Today, they are sold out... Hope they get more in, as I will definitely be buying more from them!!! Excellent product at THE best price. good price, functioned perfectly, fast shipping. Q: My rifle barrel has a twist rate of 1 in 7. 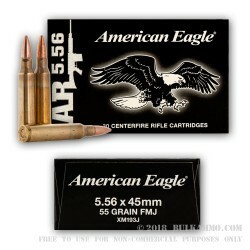 Would you recommend the XM193 ammo, or would another 5.56x45 be more accurate? A: Your rifle will be accurate with any 5.56x45 ammo. The 1/7 twist rate for the .224 diameter bore will stabilize any bullet that can be safely loaded to magazine length. Q: Do the stripper clips add a lot of weight and do the ever rust or corrode to the point it's difficult to retrieve the rounds? A: The stripper clips are extremely light, and will not corrode if the ammo is stored properly. If the ammo is stored improperly, corrosion on the stripper clips will be of minor concern compared to the potential for deterioration of the ammunition. Q: Does a stripper clip "feeder adapter" (not sure what they are called) come with the product? If not, can one be purchased separately from bulk ammo? A: No, the guides do not come with the product. We offer 3-packs of the stripper clip guides under the "Shooter's Ridge" brand. Q: Does this deal include a stripper clip guide, for loading into AR-15 magazines? A: No, stripper clip guides are not included, but we do offer three AR-15 magazine stripper clip guides for a very reasonable price. Q: How do the stripper clips make them easier to load other than having the cartridges oriented the same way? A: Using a stripper clip guide, magazines can be loaded very quickly, just by pushing on the ammo at the bottom of the case. 10 rounds can be loaded into a magazine in half a second or less. Q: California recently put restrictions on ammunition containing lead. Will that affect American Eagle Brand? That is all I have ever put through my carbine. A: No, those restrictions are only on hunting in areas where the California Condor is present. You are still able to buy and shoot lead core ammunition in California outside those areas. 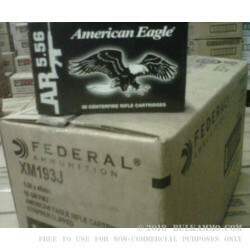 A: This 5.56 ammo will have approximately the same accuracy as the Federal value packs of 100 rounds. Q: How good are the stripper clips? are they steal? do you need special training or a guide to go over the magazine to help feed in the bullets. Thanks. A: The stripper clips are very durable. They're made from parkerized steel and brass. We offer a three pack of AR-15 magazine stripper clip guides separately. Q: is this round & a tracer round the same size all around? like can tracer lead be reloaded into these casings? A: If you have access to .224" diameter tracer bullets and have the requisite skill and knowledge to safely reload ammunition, then yes, you can use the fired cases from this ammo to make tracer rounds. Q: Are the stripper clips new? A: Yes, the stripper clips are new manufacture. Q: Is the same Lake City brass used in the XM193 as that which is used in the XM855? I plan to reload this brass and would like to have a good supply of brass that has little variation. A: Yes, both XM193 and XM855 are loaded with Lake City brass. A: The difference is primarily in the designation - XM193 was not sold to the government, while M193 was. Both M855 and M193 will work fine in 1/9 twist barrels. Q: My rifle says that it can take both .223 and 5.56 sized rounds. Is there any benefit using one caliber over another? A: 5.56mm ammo will offer higher velocities, greater terminal performance, greater barrier penetration, and less wind drift and drop at long distance than .223 Rem. .223 Rem might have slightly less recoil and muzzle flash. Q: So many companies make ammo. Short of buying some from every maker, is there a way to find out who makes the best quality at a reasonable price? Does it just depend on Price? Accuracy? Realoadability? A: Well, if you're looking for accurate ammo, check out ammo that is described as "match" by the manufacturer. If you want cheap ammo, then pretty much anything will do. If you want ammo that's reliable under harsh conditions and designed for military use, buy military surplus or contract overrun ammo. Almost anything with a brass case can be reloaded. It all depends on what you want to do with the ammo. Q: What is the best way to remove the primer crimp for reloading? A: The Dillon Super Swager is very popular for this purpose - it is efficient and effective. Q: Is this previously fired brass, or a new loading? Thanks! 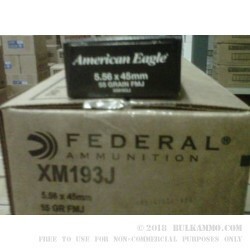 A: Federal uses all new brass for this XM193 ammunition. Q: It is my understanding that a rifle chambered for 5.56 can fire either 5.56 or .223 yet, a rifle chambered for .223 should only have .223 fired through it. Is this true and what are the differences of the two rounds? A: This is true. The chamber of a .223 rifle has a shorter leade and .223 ammo is loaded to lower pressures when compared to 5.56 ammo and pressures. When 5.56 ammo is used in a .223 chamber, pressures exceed not only standard .223 limits, but also 5.56 limits, which is a dangerous and undesirable situation. Q: AR's being the picky eaters they are, how well do AR's digest this ammo? A: This ammunition is specifically designed for use in AR-15 platform weapons. A: It is not advisable to fire 5.56 ammo through a .223 Rem chambered rifle, as excessive pressures can result. Q: I have heard that military rifle brass can not be reloaded is this true ? A: This Federal ammunition features boxer primed, brass cases, which can be used for reloading. The primers are crimped for reliability in semi-automatic firearms, which poses a minor difficulty to reloaders, but does not prevent them from being reloaded. All that needs to be done is for the primer to be removed, and a special tool used to press the edges of the primer pocket back to their normal, pre-crimped position. Then, the cases can be used for reloading just like any other. A: Because this Federal XM193 ammunition was loaded on a military production line, the primers are crimped. Q: Why does the "neck" of these cases look discolored? Thanks. A: During manufacturing, the cartridge cases are "annealed." This process makes the brass easier to work and less brittle. Because of the temperatures involved, discoloration is common, but the process results in higher quality brass. Q: Does the XM193 marketed to civilians differ from M193 used by the military? A: The XM193 ammo is fundamentally the same as the M193 that was once used by the military. Federal states that the X means that it was intended for government sale but was instead sold to civilians. 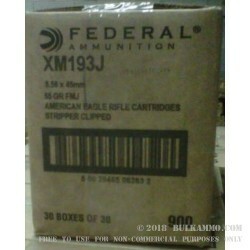 Q: Since the feeders are no longer included, is this ammo packed loose in boxes of 20? A: As stated in the description, this ammo comes on 10rd stripper clips in boxes of 30 rounds each. Q: It has been my experience that most people I know without LE/military backgrounds don’t understand the purpose, benefits, and proper method of using stripper clips, especially in AR style rifle magazines. Do you include any type of information or instructions on this subject when shipping the order to the customer? Would this be something you would consider? A: At this time, we ship the ammo as we receive it from the manufacturer. Q: Can this ammo be used in a rifle stamped .223? A: It is not recommended to fire 5.56mm pressure ammunition in a .223 rifle. Federal does manufacture ammunition with a 55gr projectile loaded to .223 pressures. Q: do you offer the bandoliers for this ammo and if so how much per? A: We do not currently offer bandoliers. Q: how fast is a stripper clip load vs a speed loader like maglula? I am guessing with training the clips are faster. A: Both can be quick methods of loading magazines, but both require practice to be extremely fast. Stripper clips are probably easier to get the hang of. Q: would you recommend 55 grain bullets for a 1 in 8, 1 in 9 inch twist barrel, or does it make a difference? Thanks. 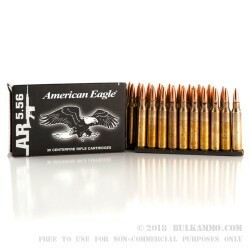 A: 55 grain 5.56 bullets will perform equally well in either a 1/8 or 1/9 twist barrel. Q: Does this ammo meet all military specs? I have heard that it is reject lots. A: Federal states that the "X" means that the ammo was not sold to the government, and that this does not mean that the ammo was from a reject lot. A: The stripper clips are the length of ten rounds standing side by side - about 4". Approximately six will fit in a single 30 round mag pouch, though some will stick out the top of the pouch. 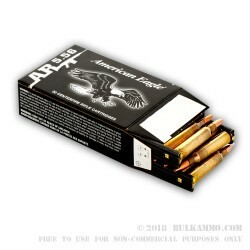 Q: I have purchased this ammo and have been very pleased with it's performance and quality. I am curious as to the future availability of this ammunition as opposed to the M855 ammunition which is current production for military use. Is the XM193 surplus forecast to continue being available and is it continually being produced by Lake City? A: There are no indications that XM193 will not continue to be available in the future. 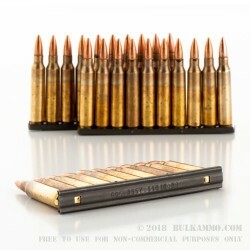 Q: After reading about the annealing process that this ammo goes through to meet military requirements, is there any other differance between this ammo and similar "civilian" ammo manufactured by Federal Ammunition other than the fact that it has not been re-cleaned? A: "Civilian" ammo might not be loaded to 5.56 pressures - it would be identified as .223 Remington, in that example. 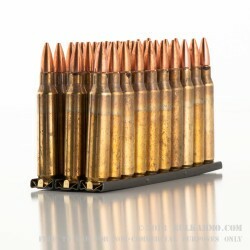 Q: I've noticed that this Lake City 5.56 ammo has brass that appears dirty at first glance. What is the reason for this? Is it reloaded ammo? 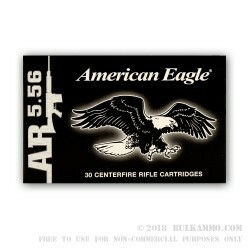 A: Much of Federal American Eagle's 5.56x45mm ammunition is manufactured at the Lake City Army Ammunition Plant which is currently operated by ATK, the owner of Federal Ammunition. This XM193 ammo is manufactured on a line at the Lake City plant designed to meet military specifications and one of those specifications is that the brass needs to have visual proof that it has been annealed. During the process of manufacturing new brass casings, the brass is being reshaped through a series of presses to form its final shape. This process of necking the new brass leaves it naturally brittle at the neck of the case. To re-strengthen the brass after it has undergone this re-sizing, the brass is run through an annealing process which essentially reheats the brass by running it through a series of flame torches. This process of running the brass through a series of flames makes the brass strong in its new molecular shape. All necked rifle brass, both commercial and military, goes through this annealing process. Commercial brass designed for civilians is re-cleaned after it has been annealed for cosmetic purposes. The military however places a stronger emphasis on quality over cosmetic appearance and as such requires that the evidence of the annealing process be left on the brass for visual inspection.